 Born in Waterville, Maine in 1933. His mother was a Lebanese immigrant, his father an orphaned son of Irish immigrants who worked as a janitor at Colby College. As a youngster, Mitchell was a talented student, but frequently found himself overshadowed by the athletic exploits of his brothers.  Received a B.A. from Bowdoin College (where he played on the basketball team) in 1954 and a law degree from Georgetown in 1960. In between pursuing his degrees, Mitchell enlisted in the army and served as a counter-intelligence officer in Berlin.  Upon graduating law school, Mitchell worked as a lawyer for the U.S. Justice Department and in his home state of Maine until 1979. During that period, he also took time out to work as an assistant and later a deputy campaign manager for Senator Edmund Muskie.  Appointed to the U.S. Senate seat vacated when Muskie rose to become Secretary of State in 1980, and won election to a full term in 1982. Became the Senate majority leader in 1988 with a staggering 81% of the vote. Occupied the role until 1995.  For six straight years during his Senate tenure, he was voted "most respected member" of the body by a bipartisan group of senior aides.  In 1994, President Bill Clinton offered Mitchell an appointment to the U.S. Supreme Court. The senator turned it down to continue his work on health care issues.  After choosing to leave the Senate the following year, he became an envoy tasked with tackling sectarian violence in Northern Island. As chairman of the peace negotiations, he helped broker negotiations that culminated in the historic Good Friday agreement. In 1998, Mitchell earned an honorary knighthood for his role in fostering the peace.  Drew fire in the late 1990s for the work he and his law firm undertook on behalf of the tobacco lobby.  Served as chairman of a Presidential committee examining the Israeli-Palestinian crisis. His team produced a report in 2001 that called for Israelis to dismantle existing settlements and urged Palestinians to crack down on militant activity.  In 2006, Mitchell was tapped by Bud Selig, the commissioner of baseball, to conduct a thorough review of the sport's cuture of performance-enhancing drugs. Mitchell found, to no one's surprise, that steroid use was endemic; still, the Mitchell Report  which was released in Dec. 2007 and which named 89 players, including superstars Barry Bonds and Roger Clemens, associated with drug use  helped quantify the extent of the problem.  Has occupied spots on the boards of the Walt Disney Co., Xerox and the Boston Red Sox, among other prominent corporations.  Received the Presidential Medal of Freedom, the nation's highest civilian honor, in 1999 for his work in Northern Ireland. "Please remember that it is possible for an American to disagree with you on aid to the Contras and still love God, and still love this country, just as much as you do. Although He is regularly asked to do so, God does not take sides in American politics." "There's no such thing as a conflict that cannot be ended. Conflicts are created, conducted and sustained by human beings. They can be ended by human beings." "I believe that neither can attain its objective by denying to the other side its objectives. Israelis are not likely to have sustainable security if the Palestinians don't have a state, and Palestinians will never achieve a state until the people of Israel have some security." "It reflects a serious commitment by the new administration to addressing the Arab-Israeli crisis. He has real negotiating experience in Northern Ireland and the Middle East and he understands the requirements of both sides." "He's neither pro-Israeli nor pro-Palestinian. He's, in a sense, neutral." 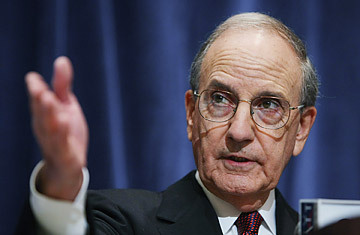 "Sen. Mitchell is fair. He's been meticulously even-handed. But the fact is, American policy in the Middle East hasn't been even-handedit has been supportive of Israel when it felt Israel needed critical U.S. support. So I'm concerned. I'm not sure the situation requires that kind of approach in the Middle East."